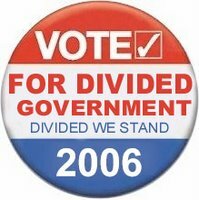 The Dividist Papers: The President of United States comments on divided government. The President of United States comments on divided government. QUESTION (Asked by Stephan Dinan of the Washington Times): Thank you, Mr. President. With a Republican Congress, you failed to achieve three major goals of your second term: Social Security reform, a tax code overhaul, and a comprehensive immigration bill. Why shouldn't Americans give Democrats a chance to work with you on those issues, especially when divided government seemed to work in the late 1990s on the budget? THE PRESIDENT: "That's a tricky little question there. (Laughter.) First, I haven't given up on any of those issues. I've got two years left to achieve them. And I firmly believe it is more likely to achieve those three objectives with a Republican-controlled Congress and a Republican-controlled Senate. And I believe I'll be working with a Republican-controlled Congress and a Republican-controlled Senate. I understand here in Washington people have already determined the outcome of the election, like it's over even before the people actually start heading -- voting. But that's not what I see when I'm on the campaign trail. Yes, we've got some people dancing in the end zone here in Washington, D.C.; they've got them measuring their drapes; they're going over to the Capitol, and saying, my new office looks beautiful, I think I'm going to have this size drape there, or this color. But the American people are going to decide, and they're going to decide this race based upon who best to protect the American people and who best to keep the taxes low. Secondly, I'll tell you what I see -- you didn't ask, but I'm going to tell you anyway. I see there's a lot of enthusiasm amongst the grassroots activists. Our people are going out there to man the phones and to put up the yard signs. You know, they're showing up when it comes time to -- these absentee votes. We're organized. We've got a fantastic grassroots organization to turn out the vote. This campaign has obviously got national implications to it, no question about it -- the Iraq war, the security of the country, economic vitality and growth. But each of these elections turn out to be local in their scope and in their character. And we've got good candidates running hard. And we're going to win. Now, I know that defies conventional wisdom here. I'm not suggesting anybody in this august crowd has determined the outcome of the election already, but they're running profiles on who this person is going to be running this office, or this one that's going to be -- magazines have got all kinds of new stars emerging when they haven't won the votes yet. And anyway, thanks for asking about the campaign. I'm enjoying it out there. I like campaigning. It's what guys like me do in order to get here. We campaign. We shake the hands, you know, and give the speeches. And Laura is campaigning, too. From my perspective, our people are ready to go out there and vote for -- vote our candidates back into power. Many words saying very little. Net net - "I like single party Republican control and I think we'll keep it." No surprise with an election in 12 days. We'll find out then if the American people agree, that the single party Republican control of the last six years is deserving of an additional two. I wonder if he'll go back to the "uniter not a divider" slogan if the Democrats take the House of Representatives. Lets call this a placeholder, and we'll update this post with a Presidential compare and contrast on November 8. 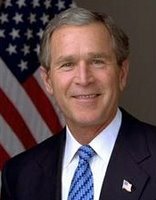 "What are the chances that divided government could also be productive in the final two years of the Bush presidency? Better than might be imagined -- especially given the president's agenda. Comprehensive immigration reform? The bill embodying most of what the president wanted was co-sponsored by Republican John McCain and Democrat Ted Kennedy. On the vote for passage, Democrats were 38 to 4 in favor, Republicans 32 to 23 against. Clearly, the president's best allies on immigration are on the Democratic side. Tax reform? Well, the last major successful reform of the code took place in 1986, when Republicans controlled the White House and the Senate and Democrats held the House. Instrumental in its passage was Democrat Bill Bradley, then a senator from New Jersey. Last week Bradley was back in Washington to support another Democratic senator, Ron Wyden of Oregon, who offered an open invitation to Bush to join in moving forward a long-overdue cleanup of the tax code. Social Security reform, the third of the president's objectives, will be politically difficult no matter which party controls Congress. For most Democrats, the president's proposal to carve out room for individually owned accounts is a nonstarter. But if Bush is willing to do what his ally, Sen. Bob Bennett of Utah, suggested long ago and postpone private accounts until steps are taken to solve the system's long-term fiscal problems, he may find the Democrats ready to listen to his other ideas for reform. None of this would be easy, and all of it would require a new willingness on Bush's part to open himself to genuine negotiations with the next Congress. But the rewards for the country could be very large." I could not have said it better myself. Tip of the hat to Michael Bains at Silly Humans, who is dubious but hopeful that GWB will rediscover the bibartisanship that he exhibited as governor of Texas. Technorati tags: divided government, 2006 election,Press Conference,Bush. Thanks for the linkage, MW. As we near election day, I'll not say as my hope for wisdom from GWB is growing, but my belief that he'll not be able win the types of political battles which Slick Willie did with that Congress is a bit on the uptick. It'll all depend on how much of a majority - at least in the HoR - the Democrats do gain. The Senate .. well, as long as the Dems close the gap, I think bipartisanship will be growing therein as well.